Download "AACE International Recommended Practices"
1 AACE International Recommended Practice No. 52R-06 TIME IMPACT ANALYSIS AS APPLIED IN CONSTRUCTION TCM Framework: 6.4 Forensic Performance Assessment, 7.2 Schedule Planning and Development, 10.2 Forecasting, 10.3 Change Management Acknowledgments: Timothy T. Calvey, PE PSP (Author) Ronald M. Winter, PSP (Author) Edward E. Douglas, III CCC PSP Earl T. Glenwright, Jr. PE PSP Kenji P. Hoshino, PSP William H. Novak, PSP Lee Schumacher, PE PSP Lawrence R. Tanner, PSP James G. Zack, Jr. Copyright 2006 AACE, Inc.
2 AACE International Recommended Practice No. 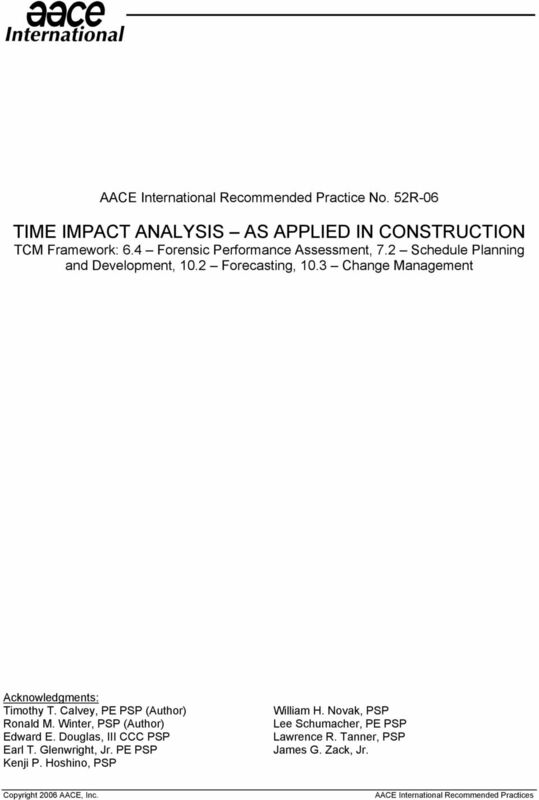 52R-06 TIME IMPACT ANALYSIS AS APPLIED IN CONSTRUCTION TCM Framework: 6.4 Forensic Performance Assessment, 7.2 Schedule Planning and Development, 10.2 Forecasting, 10.3 Change Management PURPOSE This Recommended Practice for Time Impact Analysis (TIA) is intended to provide a guideline, not to establish a standard. 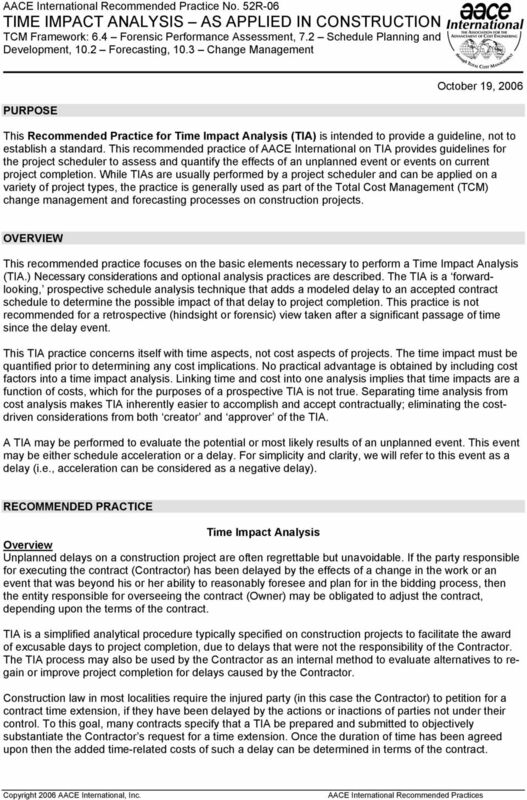 This recommended practice of AACE International on TIA provides guidelines for the project scheduler to assess and quantify the effects of an unplanned event or events on current project completion. While TIAs are usually performed by a project scheduler and can be applied on a variety of project types, the practice is generally used as part of the Total Cost Management (TCM) change management and forecasting processes on construction projects. OVERVIEW This recommended practice focuses on the basic elements necessary to perform a Time Impact Analysis (TIA.) Necessary considerations and optional analysis practices are described. 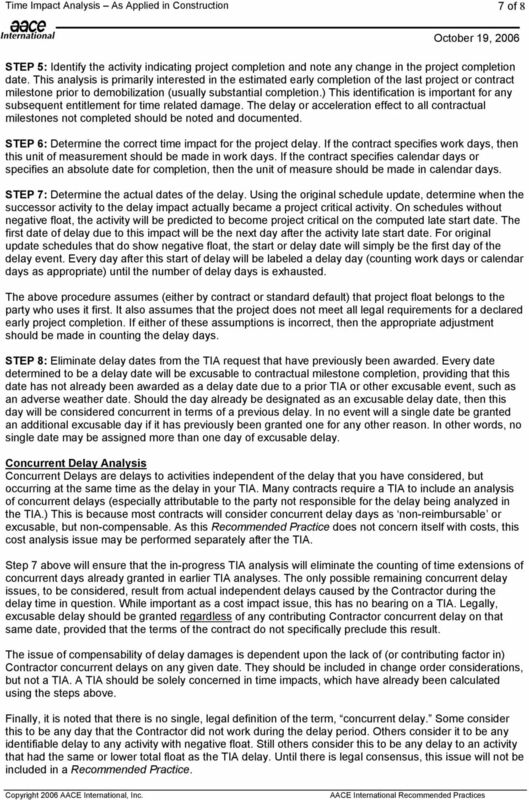 The TIA is a forwardlooking, prospective schedule analysis technique that adds a modeled delay to an accepted contract schedule to determine the possible impact of that delay to project completion. This practice is not recommended for a retrospective (hindsight or forensic) view taken after a significant passage of time since the delay event. 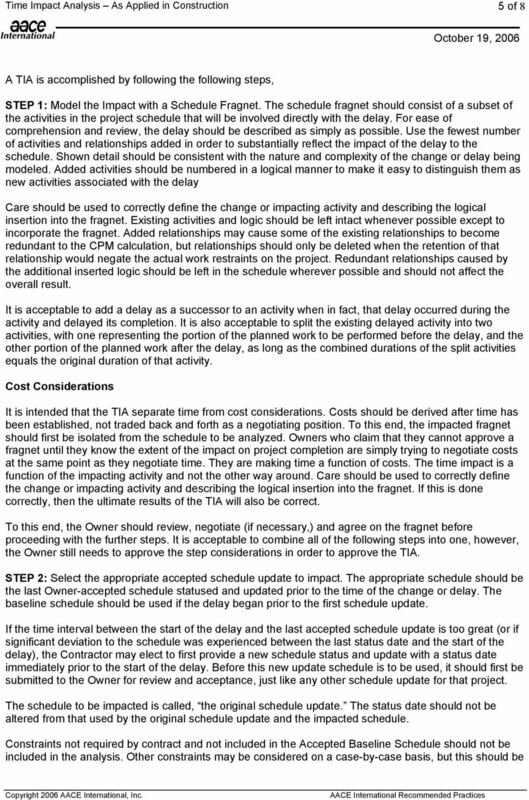 This TIA practice concerns itself with time aspects, not cost aspects of projects. The time impact must be quantified prior to determining any cost implications. No practical advantage is obtained by including cost factors into a time impact analysis. Linking time and cost into one analysis implies that time impacts are a function of costs, which for the purposes of a prospective TIA is not true. Separating time analysis from cost analysis makes TIA inherently easier to accomplish and accept contractually; eliminating the costdriven considerations from both creator and approver of the TIA. A TIA may be performed to evaluate the potential or most likely results of an unplanned event. This event may be either schedule acceleration or a delay. For simplicity and clarity, we will refer to this event as a delay (i.e., acceleration can be considered as a negative delay). RECOMMENDED PRACTICE Time Impact Analysis Overview Unplanned delays on a construction project are often regrettable but unavoidable. If the party responsible for executing the contract (Contractor) has been delayed by the effects of a change in the work or an event that was beyond his or her ability to reasonably foresee and plan for in the bidding process, then the entity responsible for overseeing the contract (Owner) may be obligated to adjust the contract, depending upon the terms of the contract. TIA is a simplified analytical procedure typically specified on construction projects to facilitate the award of excusable days to project completion, due to delays that were not the responsibility of the Contractor. The TIA process may also be used by the Contractor as an internal method to evaluate alternatives to regain or improve project completion for delays caused by the Contractor. Construction law in most localities require the injured party (in this case the Contractor) to petition for a contract time extension, if they have been delayed by the actions or inactions of parties not under their control. To this goal, many contracts specify that a TIA be prepared and submitted to objectively substantiate the Contractor s request for a time extension. Once the duration of time has been agreed upon then the added time-related costs of such a delay can be determined in terms of the contract. 4 3 of 8 More Useable: Frozen work plan If the Contractor has not been given remediation direction and is not able to redeploy his work force in order to remain in readiness for resumption of work, then the work plan is said to be frozen and the assumptions inherent in a TIA remain valid. Forward looking Delays expected to occur or occurring at the present time are better subjects for a TIA then those that have already finished. Using actual durations in place of estimates then suggests the need for a review of operational efficiency of the actual work and the removal of any of the time also spent on contract work during the delay period. In addition, the tendency for parties to wait and observe the actual durations is in conflict with the primary purpose of timely resolution in TIAs. Short duration of delay In general, TIAs are intended to model delays of less than one reporting period. If longer periods are considered, then an additional step (detailed below) must be considered. This optional step is needed to address the legal requirement and natural tendency of the Contractor to mitigate any delays where the mitigation does not involve additional costs. Mitigation effects become more pronounced as time progresses after a delay has occurred. Less Useable: The more your schedule update does not reflect actual conditions at the time of the delay The longer the time period between the date that the schedule update reflected the status of the project and the date of the start of the delay event, the more conditions will have changed between the planned forecast schedule and the actual work schedule before the time of the delay. 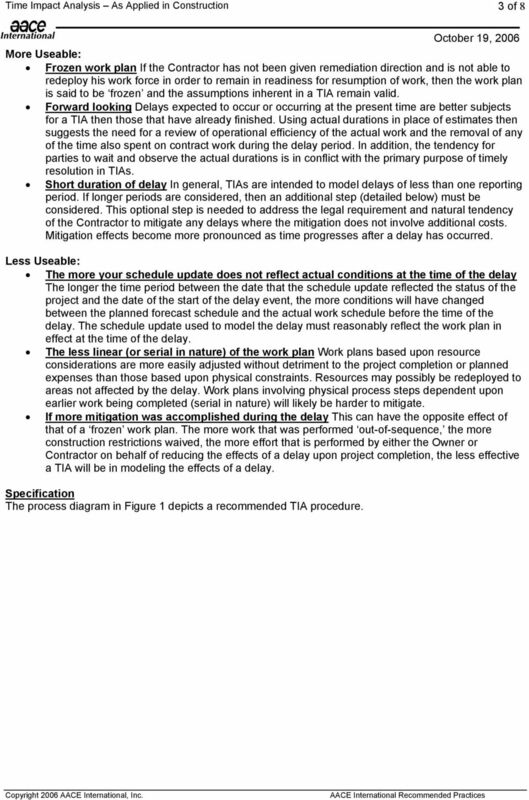 The schedule update used to model the delay must reasonably reflect the work plan in effect at the time of the delay. The less linear (or serial in nature) of the work plan Work plans based upon resource considerations are more easily adjusted without detriment to the project completion or planned expenses than those based upon physical constraints. Resources may possibly be redeployed to areas not affected by the delay. Work plans involving physical process steps dependent upon earlier work being completed (serial in nature) will likely be harder to mitigate. If more mitigation was accomplished during the delay This can have the opposite effect of that of a frozen work plan. 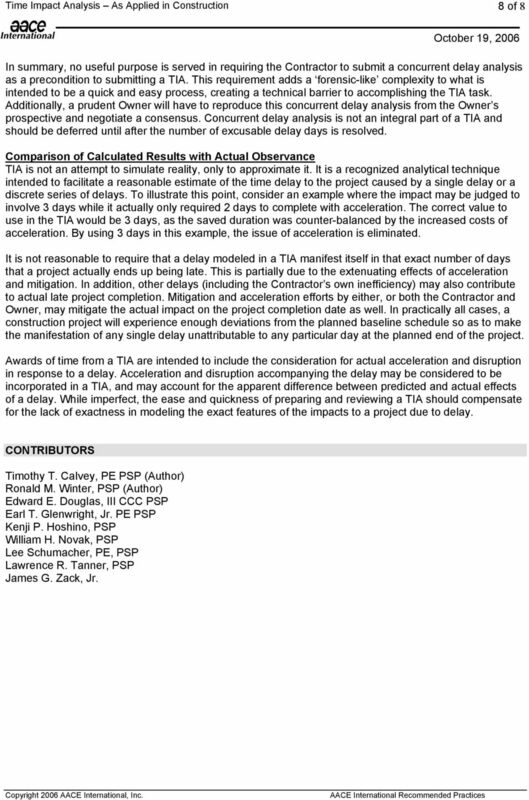 The more work that was performed out-of-sequence, the more construction restrictions waived, the more effort that is performed by either the Owner or Contractor on behalf of reducing the effects of a delay upon project completion, the less effective a TIA will be in modeling the effects of a delay. Specification The process diagram in Figure 1 depicts a recommended TIA procedure. 7 6 of 8 fully documented. The object is to remove constraints that do not affect the contract assumptions made when the contract was awarded. Non-contractual constraints should be removed and contractual constraints reduced to the least restrictive, before proceeding to the next step. The resultant original schedule update should not be used for any purpose other than the TIA in question. Any constraint that is to be retained for the TIA should be the least restrictive constraint that still describes the contract requirement. Following is a list of constraints from least restrictive to most restrictive: Start No Later Than; Finish No Later Than; Start No Earlier Than; Finish No Earlier Than; Start On; Must Finish; and Must Start. An automated TIA is only valid if the CPM software, being used to model the effects of a delay event, properly shows the effects of the CPM calculations. This includes the consideration of a status date, outof-sequence progress, and actual activity status. The schedule should not allow any unstarted activity to be scheduled prior to the status date. Also, it should not allow for a prediction of early completion for an unfinished activity prior to the status date. Work actually performed on activities that are not logically able to begin should be considered. The schedule should not contain activities with actual starts or actual finishes later than the status date. STEP 3a: Insert the fragnet into a copy of the current schedule update prepared as described above. Using the accepted fragnet as a template, add the impact activities and logic. Make the accepted activity adjustments to the existing activities as necessary to mirror the fragnet. Set the duration of the delay activities to zero and recalculate the CPM. At this point in the analysis, all computed and actual dates in the original schedule update should match that from the original schedule update. If all dates do not match, then correct the fragnet insertion until they do match. 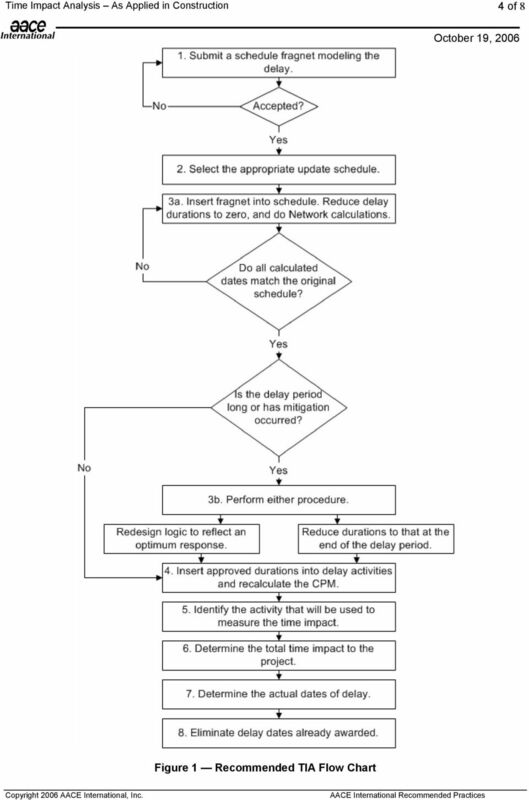 OPTIONAL STEP 3b: If the delay time period involved is long, or if substantial mitigation of the delay has occurred, then an optional step may be needed to consider the effects of mitigation. This step is necessary if mitigation efforts by either the Owner or Contractor have modified the actual impact of a delay on project completion. Skipping this step in this circumstance may result in a calculated time impact that does not closely relate to the actual impact. There must be a correlation between calculated and actual for a proposed TIA to be acceptable. Construction law requires that the Contractor mitigate the effects of any delay to the extent practable. If Step 3b is not implemented, a statement should be provided with the TIA to explain why this step was unnecessary. The reasons for not implementing Optional Step 3b may include the following: a frozen work plan, forward-looking impact analysis, and shortness of duration of the delay. 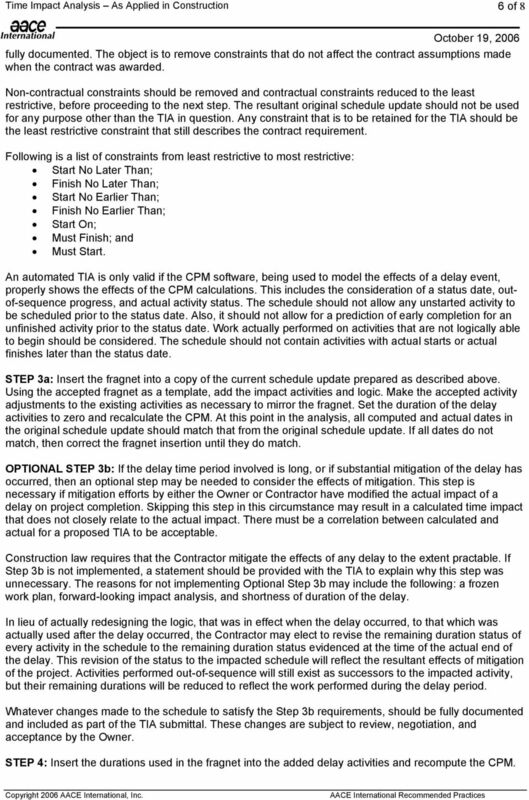 In lieu of actually redesigning the logic, that was in effect when the delay occurred, to that which was actually used after the delay occurred, the Contractor may elect to revise the remaining duration status of every activity in the schedule to the remaining duration status evidenced at the time of the actual end of the delay. This revision of the status to the impacted schedule will reflect the resultant effects of mitigation of the project. Activities performed out-of-sequence will still exist as successors to the impacted activity, but their remaining durations will be reduced to reflect the work performed during the delay period. Whatever changes made to the schedule to satisfy the Step 3b requirements, should be fully documented and included as part of the TIA submittal. These changes are subject to review, negotiation, and acceptance by the Owner. STEP 4: Insert the durations used in the fragnet into the added delay activities and recompute the CPM. 8 7 of 8 STEP 5: Identify the activity indicating project completion and note any change in the project completion date. This analysis is primarily interested in the estimated early completion of the last project or contract milestone prior to demobilization (usually substantial completion.) This identification is important for any subsequent entitlement for time related damage. The delay or acceleration effect to all contractual milestones not completed should be noted and documented. STEP 6: Determine the correct time impact for the project delay. If the contract specifies work days, then this unit of measurement should be made in work days. If the contract specifies calendar days or specifies an absolute date for completion, then the unit of measure should be made in calendar days. STEP 7: Determine the actual dates of the delay. Using the original schedule update, determine when the successor activity to the delay impact actually became a project critical activity. On schedules without negative float, the activity will be predicted to become project critical on the computed late start date. The first date of delay due to this impact will be the next day after the activity late start date. For original update schedules that do show negative float, the start or delay date will simply be the first day of the delay event. Every day after this start of delay will be labeled a delay day (counting work days or calendar days as appropriate) until the number of delay days is exhausted. The above procedure assumes (either by contract or standard default) that project float belongs to the party who uses it first. It also assumes that the project does not meet all legal requirements for a declared early project completion. If either of these assumptions is incorrect, then the appropriate adjustment should be made in counting the delay days. STEP 8: Eliminate delay dates from the TIA request that have previously been awarded. Every date determined to be a delay date will be excusable to contractual milestone completion, providing that this date has not already been awarded as a delay date due to a prior TIA or other excusable event, such as an adverse weather date. Should the day already be designated as an excusable delay date, then this day will be considered concurrent in terms of a previous delay. In no event will a single date be granted an additional excusable day if it has previously been granted one for any other reason. In other words, no single date may be assigned more than one day of excusable delay. Concurrent Delay Analysis Concurrent Delays are delays to activities independent of the delay that you have considered, but occurring at the same time as the delay in your TIA. 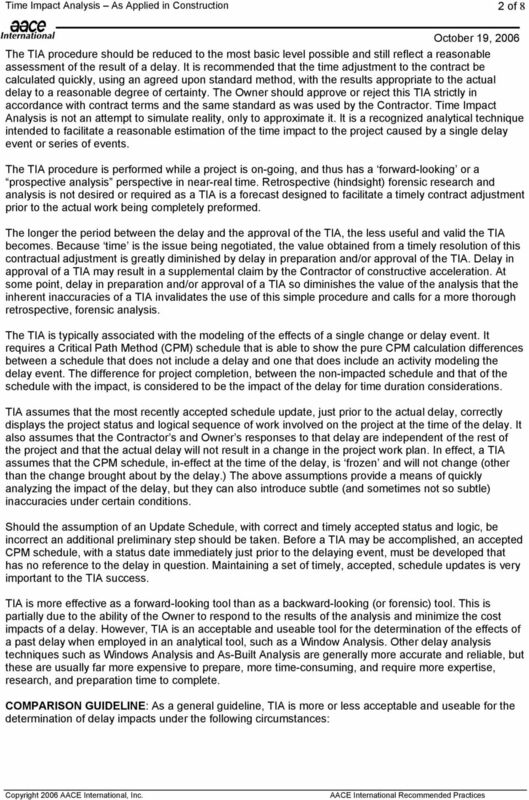 Many contracts require a TIA to include an analysis of concurrent delays (especially attributable to the party not responsible for the delay being analyzed in the TIA.) This is because most contracts will consider concurrent delay days as non-reimbursable or excusable, but non-compensable. As this Recommended Practice does not concern itself with costs, this cost analysis issue may be performed separately after the TIA. Step 7 above will ensure that the in-progress TIA analysis will eliminate the counting of time extensions of concurrent days already granted in earlier TIA analyses. The only possible remaining concurrent delay issues, to be considered, result from actual independent delays caused by the Contractor during the delay time in question. While important as a cost impact issue, this has no bearing on a TIA. Legally, excusable delay should be granted regardless of any contributing Contractor concurrent delay on that same date, provided that the terms of the contract do not specifically preclude this result. The issue of compensability of delay damages is dependent upon the lack of (or contributing factor in) Contractor concurrent delays on any given date. They should be included in change order considerations, but not a TIA. A TIA should be solely concerned in time impacts, which have already been calculated using the steps above. Finally, it is noted that there is no single, legal definition of the term, concurrent delay. Some consider this to be any day that the Contractor did not work during the delay period. Others consider it to be any identifiable delay to any activity with negative float. Still others consider this to be any delay to an activity that had the same or lower total float as the TIA delay. Until there is legal consensus, this issue will not be included in a Recommended Practice. 9 8 of 8 In summary, no useful purpose is served in requiring the Contractor to submit a concurrent delay analysis as a precondition to submitting a TIA. This requirement adds a forensic-like complexity to what is intended to be a quick and easy process, creating a technical barrier to accomplishing the TIA task. Additionally, a prudent Owner will have to reproduce this concurrent delay analysis from the Owner s prospective and negotiate a consensus. Concurrent delay analysis is not an integral part of a TIA and should be deferred until after the number of excusable delay days is resolved. Comparison of Calculated Results with Actual Observance TIA is not an attempt to simulate reality, only to approximate it. It is a recognized analytical technique intended to facilitate a reasonable estimate of the time delay to the project caused by a single delay or a discrete series of delays. To illustrate this point, consider an example where the impact may be judged to involve 3 days while it actually only required 2 days to complete with acceleration. The correct value to use in the TIA would be 3 days, as the saved duration was counter-balanced by the increased costs of acceleration. By using 3 days in this example, the issue of acceleration is eliminated. It is not reasonable to require that a delay modeled in a TIA manifest itself in that exact number of days that a project actually ends up being late. This is partially due to the extenuating effects of acceleration and mitigation. In addition, other delays (including the Contractor s own inefficiency) may also contribute to actual late project completion. Mitigation and acceleration efforts by either, or both the Contractor and Owner, may mitigate the actual impact on the project completion date as well. In practically all cases, a construction project will experience enough deviations from the planned baseline schedule so as to make the manifestation of any single delay unattributable to any particular day at the planned end of the project. Awards of time from a TIA are intended to include the consideration for actual acceleration and disruption in response to a delay. Acceleration and disruption accompanying the delay may be considered to be incorporated in a TIA, and may account for the apparent difference between predicted and actual effects of a delay. While imperfect, the ease and quickness of preparing and reviewing a TIA should compensate for the lack of exactness in modeling the exact features of the impacts to a project due to delay. CONTRIBUTORS Timothy T. Calvey, PE PSP (Author) Ronald M. Winter, PSP (Author) Edward E. Douglas, III CCC PSP Earl T. Glenwright, Jr. PE PSP Kenji P. Hoshino, PSP William H. Novak, PSP Lee Schumacher, PE, PSP Lawrence R. Tanner, PSP James G. Zack, Jr.
Who pays the Money for the Time? CRITICAL CHAIN AND CRITICAL PATH, CAN THEY COEXIST?